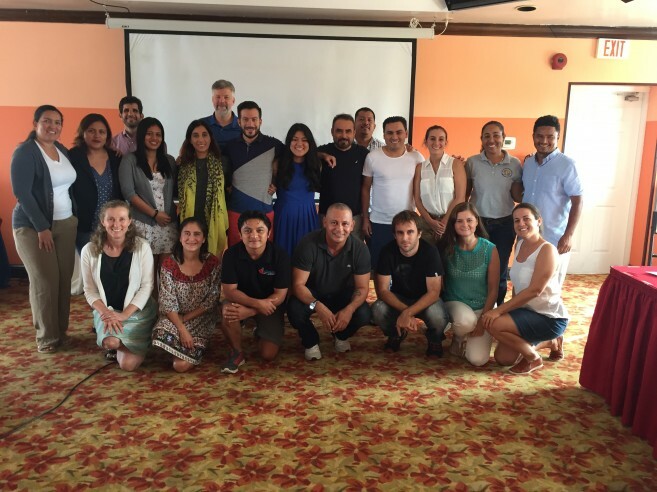 The Mesoamerican Reef Leadership Program (MAR-L) hosted its fourth week-long workshop in Belize City from Saturday, July 15th to Saturday, July 22nd. The MAR-L is an initiative of the Mexican Fund for Nature Conservation (FMCN) geared to strengthen the capacities and leadership skills of 12 conservationists from across Mexico, Belize, Guatemala, and Honduras. Representing Belize was: Julio Maaz of the Wildlife Conservation Society, Isabel Martinez of the Belize Fisheries Department (BFD), Areli Perez of the Belize Aquaculture Ltd, and John Burgos of the Belize Tourism Industry Association (BTIA). The Mesoamerican Reef is the world's largest transboundary barrier reef with an approximate length of 1000 km, which starts in Quintana Roo, Mexico and ends in the Bay Islands of Honduras. The reef shelters more than 65 coral species, 500 fish species and is home to emblematic megafauna such as turtles, whale sharks, manatees, dolphins and sharks. Since it is estimated that around 2 million people depend directly from these ecosystems, MAR-L Program's main goal is to accelerate conservation efforts to help protect marine life. During the workshop, these motivated and visionary professionals were able to learn about project design, small scale fisheries, resource mobilization, economic impact analysis, how to speak with the media, and how to create a sustainable business plan. They were also trained in economic tools for conservation and sustainable development with the Conservation Strategy Fund, and in advocacy and strategic communication with the Environmental Law Alliance to become agents of change. They also designed blue economy projects to protect watersheds, manage toxic chemicals, secure small scale fisheries, and promote community sustainable development. Martinez of the BFD told The San Pedro Sun that her experience has been great. “Mar-L is a wonderful network of people who all work in conservational efforts. This has been a great experience, and we have been doing a lot of capacity building. This is the grand finale for our 2016 cohort, and we want to boost the productive sectors in the region that are highly dependent on marine resources. Belize is a beautiful country, and we have to protect it,” said Martinez. John Burgos, Executive Director of the BTIA, stated that this workshop will allow him to apply what he has learned at the BTIA. “Part of the BTIA advocacy efforts are to emphasize a lot of both large and small scale projects. MAR-L has provided me with a lot of tools, knowledge, case studies, and a big network of professionals. I had the opportunity to understand all of the methodologies used to ensure the projects are promoting sustainable development of the tourism industry,” said Burgos. However, the Mesoamerican Reef still faces great challenges. Although great work has been done towards its protection since 1997, MAR-L states that current environmental issues need effective multinational responses, and these countries need to take their commitment a step further. According to MAR-L, there are currently four pressing concerns that negatively impact the health of the Mesoamerican Reef: discharge of effluents and contaminants, including sewage; unsustainable coastal development, including mangrove destruction; chronic pressure on fisheries and insufficient enforcement, and climate change impacts on the reef. To address these threats, the Governments of Mexico, Belize, Guatemala and Honduras must pledge to protect the reef through renewing the commitment to the Tulum Declaration and take actions to ensure the health of the reef and the people that depend on it. If you want all four countries to renew the Tulum Declaration and commit to the reef, please sign a petition at: www.marfund.org/1-millon-firmas-tulum.